Note the difference in the uniform caps of the motormen (kneeling) and the old campaign hats in this group during the early forties. By the end of 1940, the first full year of operation, there were 59 officers. The state was divided into three divisions, designated as Northern, Central and Southern, with each commanded by a Lieutenant. Since there still were no district offices, records were kept in Tallahassee from a daily report of activity mailed to headquarters by each man. The first year of activity included: 154,829 hours of patrol time, 1,000 accidents investigated, 29,860 hours at the station, 127 motorists killed, 1,938,564 miles patrolled, 1,132 persons injured and 4,836 motorists arrested. In the fall of 1941, the State Road Department supplied the Division Commanders an office in their district; the Northern District was Lake City, the Central District was Bartow and the Southern District was Ft. Lauderdale. In December, 1940, Commander H. Neil Kirkman was called back to duty in the United States Army when the threat of World War II warranted his particular talents. He served as a United States District Engineer in England, constructing bomber stations, fortresses, and warehouses. He was awarded the Legion of Merit for outstanding service and retired with the rank of full Colonel. In January 1941, Governor Spessard Holland appointed Jesse J. Gilliam Director of the State Department of Public Safety. Mr. Gilliam also assumed the duties of Commander of the Florida highway Patrol. One of the first accomplishments of the new Director was to draw up a bill reorganizing the Department of Public Safety. This bill separated the Driver License Division from the Motor Vehicle Commission and brought it under the direction of the Department. The Department was then supervised by the Governor and the Cabinet. Mr. Gilliam recommended a revision of the traffic laws and both bills were passed by the 1941 Legislature. The legislature also increased the authorized strength of the Patrol to 190 officers and the pay was raised to $150 per month. Mr. Gilliam was authorized by the Executive Board to conduct the next Highway Patrol School in Lakeland. One hundred and forty applicants reported for examinations but only 82 graduated from the training school. In 1943, Director Gilliam was responsible for legislation requiring the Director of the Department of Public Safety to be appointed by the Governor and members of the Cabinet. Director Jesse J. Gilliam served until August 1, 1945. New legislation provided that as of September, 1941, everyone applying for an original driver license would be required to pass a vision, road sign, road rules, and driving test, including those whose driving privilege had been suspended or revoked. Pictured: First Driver License Office in Dade County. Prior to this, to obtain a driver license, all you had to do was simply fill out an application and pay the required fee to the county judge. After the enactment of this law, those persons who had not previously held a license and those renewing a license were required to pass an examination conducted by thirty patrolmen specifically trained for this purpose. The patrolmen administered the driving examinations and then worked their regularly assigned patrol duties after 5 p.m. 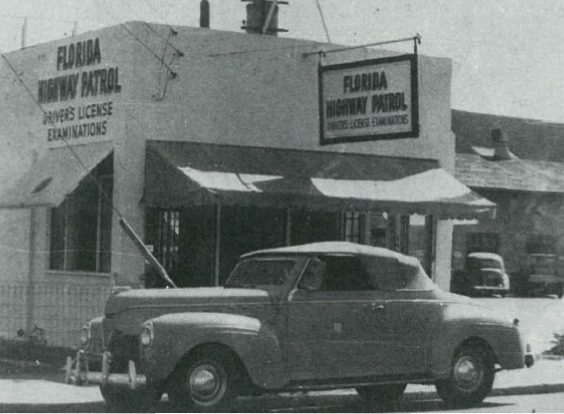 In 1948, Florida received national recognition for its driver license program from the National Safety Council. The award was presented to Colonel Kirkman at the Cabinet meeting. Governor Millard Caldwell and the Cabinet were most complementary. Patrolman Daniel was shot by an escapee, in a stolen vehicle, in Miami. He had served the citizens of Florida, with the Florida Highway Patrol, for 6 months. His career with FHP began July 1, 1941. He was in the 3rd recruit class in Lakeland, from July 1 to August 1, 1941. He was stationed in Miami. At the time of his death, he was 32. When World War II erupted in Europe, many of our patrolmen enlisted to do their patriotic duty. Other patrolmen were called up for defense work. Because of the war, it was hard to get and keep patrol officers. The Patrol’s sworn officers were down to 100 and were kept busy escorting military convoys, including gasoline tankers filled with fuel for military installations, and patrolling Florida’s 1,197 statute miles of coastline looking for illegal aliens trying to slip ashore. The Patrol, working closely with the military police, was spread thin during these war years, but did not give in or give up. In April 1942, the Federal Bureau of Investigation, aided by the Florida Highway Patrol, launched a series of raids on Florida’s east coast. They entered 67 homes of German and Italian nationals, seized guns, ammunition, dynamite, caps, fuses, and radio receivers. Some of the persons captured were classified by the FBI as dangerous. Throughout the war, patrolmen aided in the search and apprehension of prisoners of war. Supplies were extremely limited during the “War Years.” When shoes issued by the Department got badly worn, they were repaired and returned to the patrolmen. There were no new shoes. Gasoline was rationed and each patrolman was issued stamps which limited the amount of gasoline he could purchase. The only tires available were made of synthetic rubber and they would come apart at high speeds. During Director Gilliam’s administration, World War II was in progress and textile mills were using all green wool for military uniforms. Mr. Gilliam selected the army officers’ pink material for the uniform trousers and britches. In 1943, the Patrol’s uniform blouse was olive drab whipcord with silver buttons bearing the state seal, a patch on the left shoulder (the orange emblem with the word “Florida” spelled out), silver collar ornament “F.H.P.” on the left lapel and the “Winged Wheel” ornament on the right, signifying traffic. A badge, chain, whistle, army pink trousers with a 1 inch black stripe from waist to hem, black riding britches, and one pair of black plain-toed riding boots completed the uniform. Instructions were to wear riding britches and boots on each Friday, Saturday and Sunday until the forest green uniforms were phased out. Also, part of the uniform was the graphite blue Stetson hat, Sam Browne 3″ gun belt , plus handcuff and cartridge cases. Changes to the uniform included a new holster, commonly known as the “cross draw,” resting on the left hip. This type of holster was selected for the protection of the officer, because it is out-of-sight to persons under arrest. The Florida Highway Patrol radio communications system began operating in 1943. Mr. Earl Burchard installed our communication system (Motorola) beginning in Bartow, headquarters for the Central Division, Captain H. C. Martin was the Troop Commander. Whenever possible, Colonel Jesse J. Gilliam wanted to employ handicapped personnel to serve as duty officers in the radio room. By the end of 1944, there were 13 stations statewide in operation with mobile units in all the patrol cars. Monitoring services with the larger police departments were provided. Communication was established with Georgia and Alabama by placing receivers in stations along the borders, which proved very beneficial for all three states. This new radio communication system was put to the test, when a hurricane tore through Florida in October 1944, and passed with outstanding grades! The Florida Highway Patrol radio units provided the only means of communication for those areas devastated by the hurricane. On August 15, 1945, Army Lt. Colonel H. N. Kirkman returned home from the war and assumed his position as the Director of the State Department of Public Safety. The appointment was made unanimously by Governor Milliard Caldwell and the Cabinet. Captain I. Olin Hill, Executive Officer, was appointed Acting Director until Kirkman could be officially discharged from the Armed Forces on October 1, 1945. Kirkman was commander of the New Patrol when it was first created and now was returning from the war to assum the job as Director of the Department of Public Safety, a position he was to hold for 24 years. Under the direction of Director Kirkman improvements were made in the areas of growth, personnel, administration and training. Boys State, which began in 1945, is an introduction to a laboratory of practical political science. Boys State is, first a citizenship training program sponsored by the American Legion, Department of Florida, for the purpose of bringing to the youth of Florida an understanding of the fundamental principles of American government. It is, second, a lot fun for the boys who take part. Hotels were used for training school sites from the first school in Bradenton to Lakeland in 1941, and Panama City in early 1946. Later in 1946, arrangements were made to use the facilities of the U. S. Air Force Base in Kissimmee. This set the pattern for future training schools. From 1947 thru 1951, schools were held at Eglin Air Force Base where Patrol recruits were trained and houses as guests of the Air Police Squadron. In the Fall of 1946, Governor Millard Caldwell requested Colonel Kirkman provide copies of all the patrolmen’s activities to him and the Cabinet at all future Executive Board meetings. The statistical data included number of accidents, number injured and killed, property damage, arrests, written warnings and any other pertinent information. In addition, Governor Caldwell suggested this same information be given to the news media for publication to the general public and be displayed at all the state and county fairs. Colonel Kirkman appointed Captain J. Wallace Smith to assemble the statistical data. Sergeant Clay W. Keith was assigned to prepare the exhibits since he had been formerly employed by the Florida National Exhibits in Deland, Florida. The first exhibit was at the Florida Citrus Exposition in Winter Haven, Florida, in February of 1947. Governor Caldwell, Colonel Kirkman, John Snively, Captain I. Olin Hill (Troop Commander of the Central Division), and Mr. Phil Lucy (Manager of the Exposition), visited the booth. Sergeant Keith decorated the booths with orange and blue crepe paper, displayed large photographs of motor vehicle accidents and the major violations that caused traffic accidents, and showcased the various equipment the Patrol used at the time. The exhibits were an instant success with the public. Sergeant Keith found himself covering 15 county fairs as well as the annual state fair. Patrolman Bill Norris of Lakeland was assigned to the fair detail to assist Sergeant Keith. Pictured right: Governor Milliard Caldwell, Captain I. O. Hill, Captain T. Bass, Colonel H. Neil Kirkman and Mr. John Snively at the FHP Display at the Citrus Exposition. In 1946, in a meeting with the Highway Patrolman who conducted driver license examinations, Sergeant C. W. Keith learned that the great majority of truck drivers who traveled out of the state had a driver license in each state they traveled through. In 1947, Mr. Leo Foster, attorney for the Department prepared legislation on a “One License Concept.” This concept became part of the driver license compact used by a great majority of the states. This law corrected much duplication in our driver records bureau. Patrolman Bender was investigating a traffic accident, in Sanford, when a passing car struck him and left the scene. The person driving the car later surrendered at the sheriff’s office. Patrolman Bender had served the citizens of Florida, with the Florida Highway Patrol, for 2 years. His career with FHP began February 15, 1944. He went to recruit school April 9 to April 21, 1945. He was stationed in Ocala and Sanford. At the time of his death, he was 44. World War II spurred economic development in Florida. Because of its year-round mild climate, the state became a major training center for soldiers, sailors, and aviators of the United States and its allies. Highway and airport construction accelerated so that, by war’s end, Florida had an up-to-date transportation network ready for use by residents and the visitors who seemed to arrive in an endless stream. One of the most significant trends of the post war era was the steady population growth, resulting from large migrations to the state from within the United States and from countries throughout the western hemisphere, notably Cuba and Haiti. The 1947 Legislature increased the salary of patrol officers to $225 per month. Powers of arrest were broadened and laws passed providing protection and immunity to patrolmen in the discharge of their duties. The Northern division was divided this same year creating a Western Division, giving the Patrol four divisions. In 1947, the first Patrol station was built in Tallahassee. In 1949, for the first time, revenue to operate the Department of Public Safety was appropriated from the General Revenue Fund. Since its origin, it had been supported completely from the sale of driver licenses.